What if this restless feeling inside of you was not a bad thing? What if it is a God given feeling to draw you closer to Him. This 8-week study will look at the life of Joseph and see how his passions, relationships and suffering fit into the greater story of God. Jennie Allen, the author of the Restless Bible Study will be this year’s speaker for Ignite. So come get a taste of what God is going to do with the women of StoneWater Church through this study and Ignite this year. 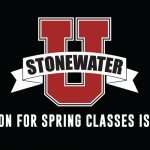 This class is a 8 week class on Tuesdays from 6-8pm. Class begins on February 7th and costs $10.00.